Looking for something useful to do with your Apple Watch? Dexcom, the maker of a continuous glucose monitor (CGM) for diabetics, suggests you use the watch to monitor CGM –your own or someone else’s. This functionality has been available as a smartphone app, but the watch version is designed to be more convenient and discreet. Is the Apple Watch useful or more of a toy or gimmick? For people with diabetes, their family members and loved ones, the Apple Watch is an extremely useful tool. It lets people access their blood glucose data right from their wrist, providing superior convenience and discretion. What opportunities does the watch provide for people with diabetes? What is the incremental improvement from a smartphone? The Apple Watch allows greater convenience for those who want this important information in an easy-to-use and discreet form. We share Apple’s commitment to making technology more accessible, relevant and personal. 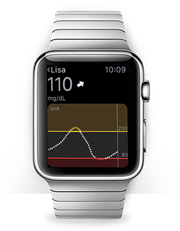 How does the Dexcom CGM work on the Apple Watch? 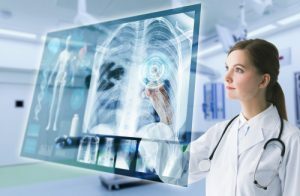 What are patients really getting? Dexcom CGM provides patients the opportunity to track their glucose levels and trends right on their wrist with the Apple Watch. Here’s how it works: The user downloads either of the Dexcom apps, Share2 or Follow to their iPhone. The Dexcom G4 PLATINUM System with Share transmits that user’s glucose information to the Share receiver using BLE (Bluetooth Low Energy) wireless communication technology. The Share receiver then sends the information through the iPhone to the watch. The Dexcom apps on the iPhone sync with the watch to provide caregivers and people with diabetes continuously updated glucose information and trend graphs. Additionally, patients or “Sharers” can invite up to five people to view their glucose information and send an alert when the sharer’s glucose levels are outside the norm. What are the benefits to allowing other users to “follow” your glucose levels on their own devices? The Dexcom apps will now enable users to monitor glucose on the Apple Watch so that people with diabetes can discreetly view their own information while parents and caregivers can conveniently view a child or loved one’s glucose data, giving them peace of mind and reassurance when they are apart. Examples of people who may benefit include a parent who can monitor a child’s blood glucose levels at night, while the child is at a sleepover, or away at camp or college. Or, a spouse can monitor their loved one’s glucose while they are away on a business trip. It’s useful for anyone who wants to monitor or share glucose information from a remote location. What information can a person with diabetes or caregiver get when they log into the apps? Through the Dexcom apps, Share2 and Follow, caregivers and people with diabetes have access to glucose data in real time. They allow both users and “followers” to view glucose data directly on their phone and now on the watch. Does the Watch set off alarms for patients and followers? Yes, with an iPhone and the Follow app installed, the watch can alert the Sharer and follower when the Sharer’s glucose levels are outside the designated range, allowing appropriate action to be taken. Can patients just use the watch and no longer wear the receiver? Patients will need to have the Dexcom receiver in order for the glucose data to be sent to the iPhone and the watch. For the Apple Watch to work for this purpose, the receiver and the phone are both needed. What is the benefit of CGM in relation to other methods for monitoring and managing diabetes? For someone with diabetes, monitoring blood glucose, or blood sugar, levels is a very important part of managing their diabetes. The traditional method for monitoring blood sugar levels is with a blood glucose meter where only a point in time reading is viewed a few times per day. But CGM is a dynamic tool that provides continuous glucose readings (up to 288 readings per day) along with the speed and direction that the glucose levels are headed. In addition, CGM has alerts to let the user know when they are heading too high or low so that action can be taken prior to it reaching a level of concern. Continuous glucose monitoring, or CGM, is considered the most significant breakthrough in diabetes management in the past 40 years.CGM augments the use of glucose meters for the management of diabetes. Meters are still required to calibrate CGMs and for guidance in making therapy and meal decisions. How do patients with diabetes go about getting the diabetes app? Is it included with the watch, is there an additional cost? The Share2 and Follow apps can be downloaded for free through the App Store. Is CGM for Type 1, Type 2 or both? A Continuous glucose monitor, or CGM, can be used by any person with type 1 or type 2 diabetes on insulin who is concerned about his or her diabetes management. People with diabetes who take insulin must monitor their blood glucose levels frequently. Uncontrolled glucose can cause health complications and can even be life-threatening. There have been concerns about the Apple Watch battery life. Is there any impact on CGM? The Dexcom receiver houses all the CGM capabilities. In order to get CGM functionality on the Apple Watch, patients must have their receiver with them at all times.